A cool spring day in the garden inspired a gathering of vegetables and herbs of the moment. We sat around communal bowls of freshly picked and simply prepared vegetables, one after the other. 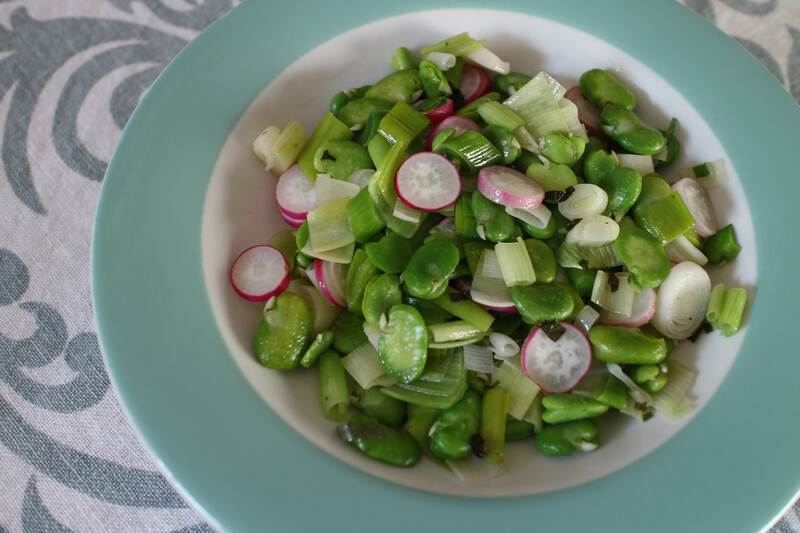 There were picturesque French breakfast radishes, tiny pungent scallions, plump stalks of asparagus with a sprinkling of olive oil and salt, rhubarb compote smeared on quinoa cakes, and this delectable medley of buttery fava beans, leeks, green garlic, crisp radishes and herbs. We finally felt that the spring harvest had arrived. At this time of year, you can eat the inner pods of fava beans, but here I chose to peel off the second shell. After shelling the beans from the long green pods they grow in, you plunge them in boiling water for less than a minute, shock them in cold water and pierce the pod just enough to be able to squeeze the bright green centers onto a plate. We prepared the favas as we were eating our successive plates of vegetables.